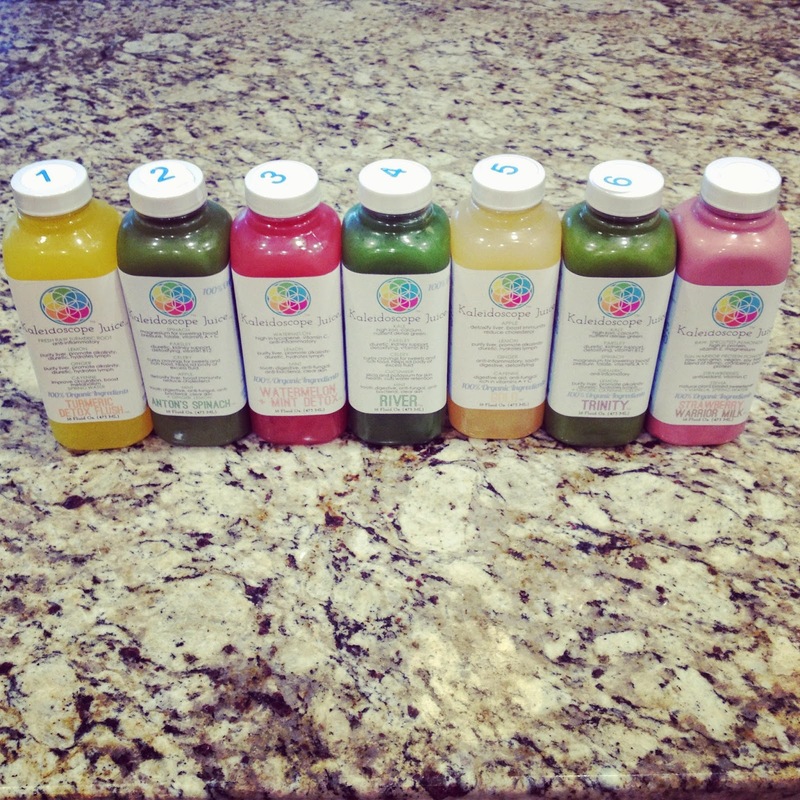 Have you ever wondered what it's like to do a juice cleanse? 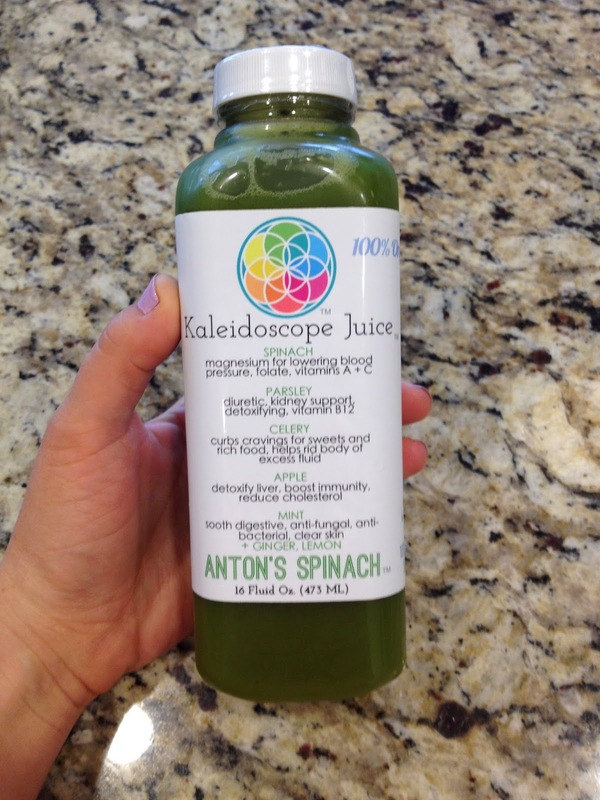 Well, step into my shoes for my two-day juice fast from Kaleidoscope Juice! Max was out of town for work these days, and I made sure our schedule was open and easy with no commitments since I didn't really know how the cleanse would go. Read on for Day One! 6:30AM I wake to little man babbling to himself. This is a bit early for him (and mamma) so I mentally will him back to sleep, but alas he is up for the day, so I am too! I know it’s Juice Cleanse Day, and time to start juicing, however I feel not an ounce of hunger. I’m not much of a breakfast person (except for coffee right when I wake up), plus I had a big dinner the night before (a girls night out for awesome sushi at Roka Akor, yum!). 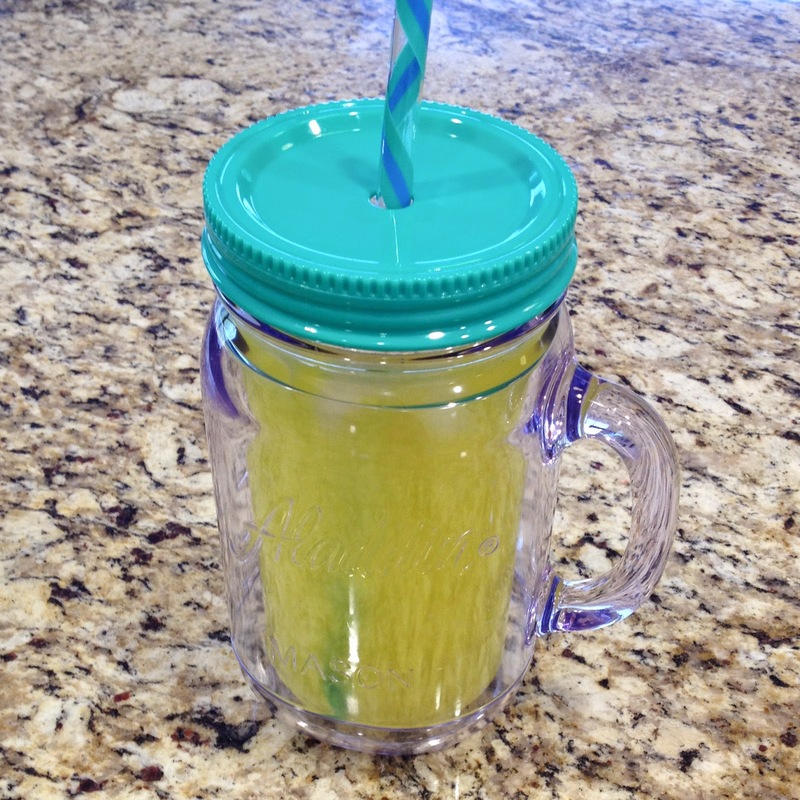 I head to the kitchen anyway for my first drink of the day, the Turmeric Flush. This is the first drink for any Juice Cleanse at Kaleidoscope, and they suggest diluting it with spring water if it’s too strong. I go right to the diluting, pouring half water and half Tumeric Flush in my ginormous mason jar mug (I throw in some heart shaped ice for good measure). I wince before taking my first sip, having no idea what to expect. What I got was mostly watered down ginger. Not bad at all. By this time, little man has decided to stand in his crib and is shouting “ah, ah!” so I run upstairs with my drink to greet my baby boy. He is very interested in my beverage. 7:30AM After changing my littlest man and reading his favorite stories in his nursery, we head downstairs for breakfast. 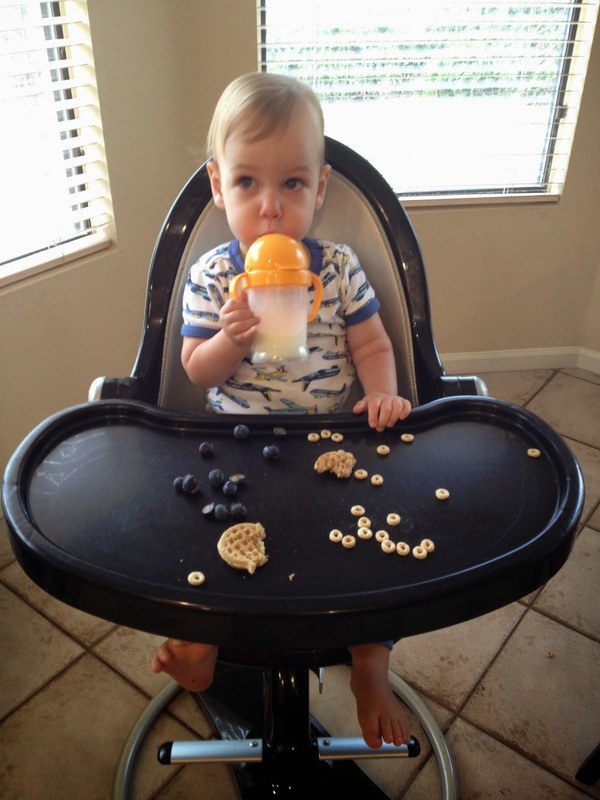 Parker drinks milk from a sippy cup as I prepare his breakfast of waffles with cream cheese and blueberries. 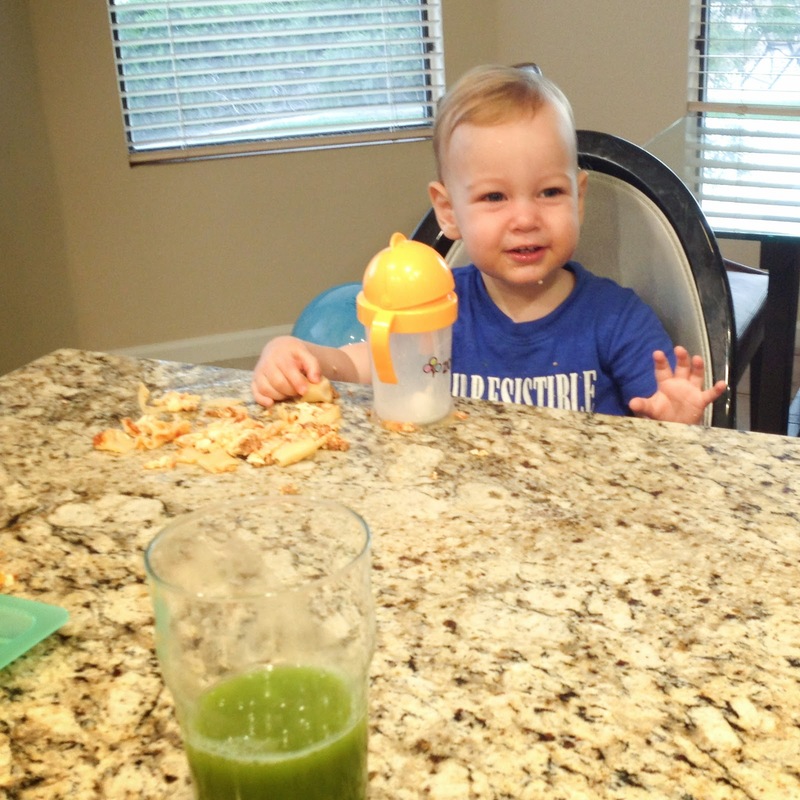 8:00AM Parker finishes his breakfast and I open my “breakfast” drink, Anton's Spinach. As I’m opening the refrigerator I get a vision of an In-N-Out cheeseburger. Then I think of the fries. Then I think this is bad, as it’s barely 8am on my first day of juicing and I’m daydreaming of fast food. I completely blame my husband, who recently pointed out that when we move to Alabama we will have NO access to In-N-Out, and that we should get it in while we can. I transfer Anton's Spinach to a mason jar tumbler. It's is a bit hard to get down, partially because it’s so early in the morning and partially because my tummy is doing flips from waking up early and eating (well, drinking) immediately upon waking. Each sip gets a little better. 8:30AM Naptime for P. He usually goes down super easily for naps, though now he requests his “rilla” anytime he’s in his crib (his tiny stuffed gorilla). I jump at the opportunity to go back to bed. Don’t judge, chasing after a toddler all day is exhausting! After my cat nap, I get ready for the day and then tackle some laundry. 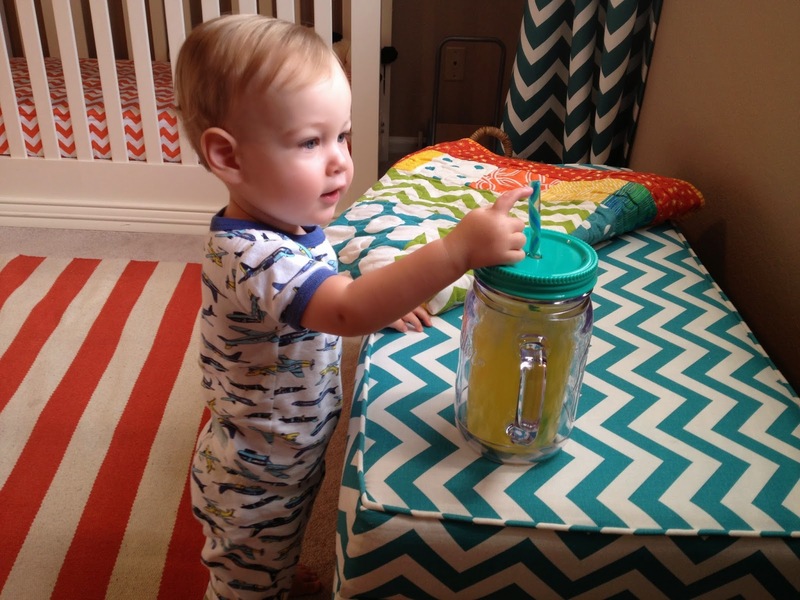 10:30AM Time for juice three! I still have lots of the Turmeric Flush, but directions say it’s okay to sip throughout the day so that’s what I’ll do! I had put the Watermelon Flush in the freezer around 10:00am to get it really cold, and it turned a bit slushy. Yum! Definitively my favorite so far. 11:15AM Parker is up after an extra long nap! I’m guessing it’s because he woke up extra early for the day. We play and read upstairs and head down for his snack. 12:00PM Parker munches on cheese and grapes and crackers while I finish my Watermelon Flush. We facetime with Auntie SheShe and Omi in California, then have a dance party and chase a big ball around the house. 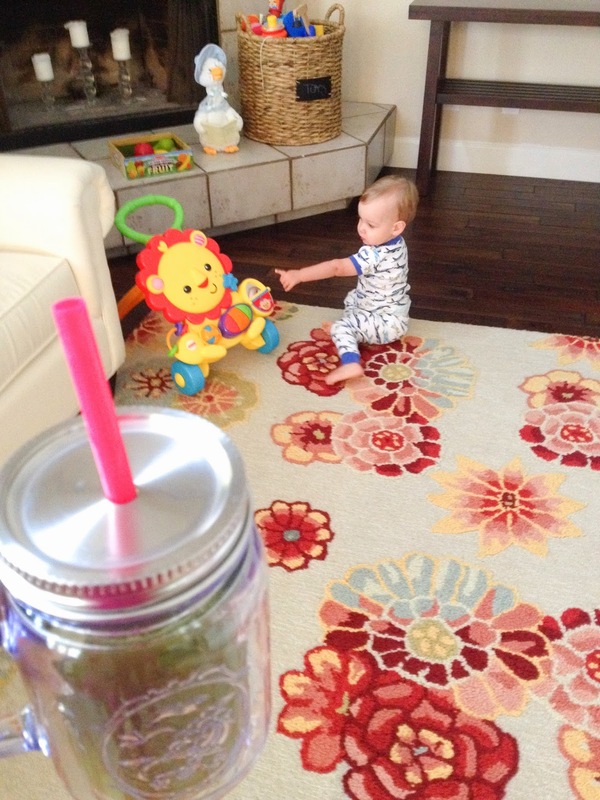 1:00PM Smoothie for P (strawberry, banana, spinach! ), the River for Mamma. Lots of celery in this one, and I’m stiiill sipping on the Turmeric Flush. Parker also munches on a peanut butter sandwich. He takes about two bites and then throws the sandwich on the floor. I debate for a millisecond shoving the whole thing in my mouth. Instead I just hold it right close to my nose and inhale the white bread goodness. This is normal, riiiight? 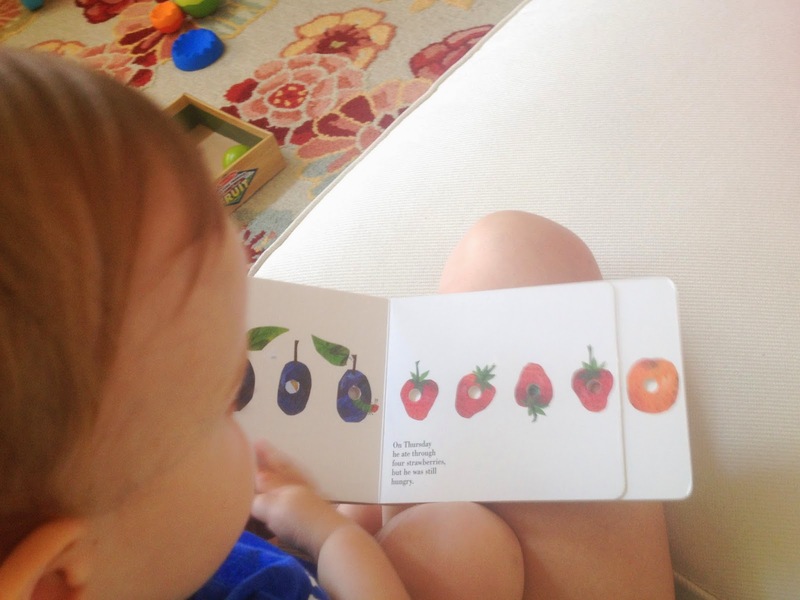 2:00PM Parker goes over to his basket of books and selects The Very Hungry Caterpillar and giggles as he runs over and places it in my lap to read. It's like he's mocking my fast! 2:30PM Parker goes down for his nap and a mini Monsoon rolls in. Lots of lightning, thunder, wind and rain. When the winds lets up I venture outside (now that the temperature has dropped significantly) to water the flowers and clean up the yard for Friday's house showing. 4:00PM I pop open the Gold, yum! Green apple, lemon, ginger, and cayenne. So light and bright and refreshing. I see I still haven't finished my Turmeric Flush. I think about how the hard part of juice cleansing is really trying to consume so much liquid. There is always something to sip on! And they recommend drinking lots of water with the juices. Whaaat??? 5:00PM Parker wakes up and we FaceTime with daddy. Parker alternates between carrying the iPhone around and giving dada kisses, and dropping the phone and playing with his books and toys. I tell Max that I'm developing an appreciation for all the foods I was taking for granted. Really. Improve Your Relationship With Food is one of the benefits listed for a juice cleanse; I thought it was kind of cheesy when I read it but I totally understand it now. 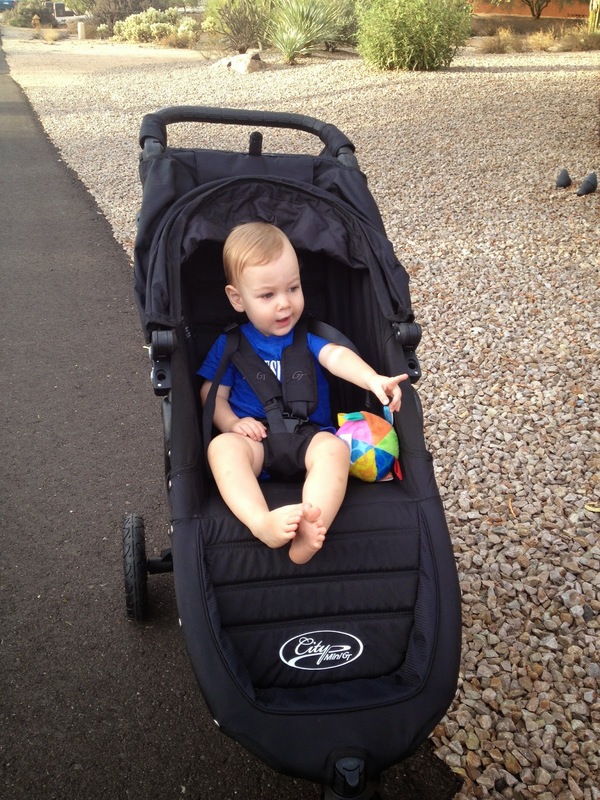 6:30PM Since it's semi-cloudy and not too hot, Parker and I head out for a neighborhood walk. Baby boy loves pointing to everything he sees! 7:00PM Dinner time. Parker gets leftover lasagna. Mamma gets the Trinity. Y'all this was the saddest part of the juice cleanse, watching Parker eat lasagna while I sipped on my green drink. 9:00PM Parker has been in bed for an hour, which gave me enough time to clean the kitchen and put away all his toys, and get all cozy in my jams. 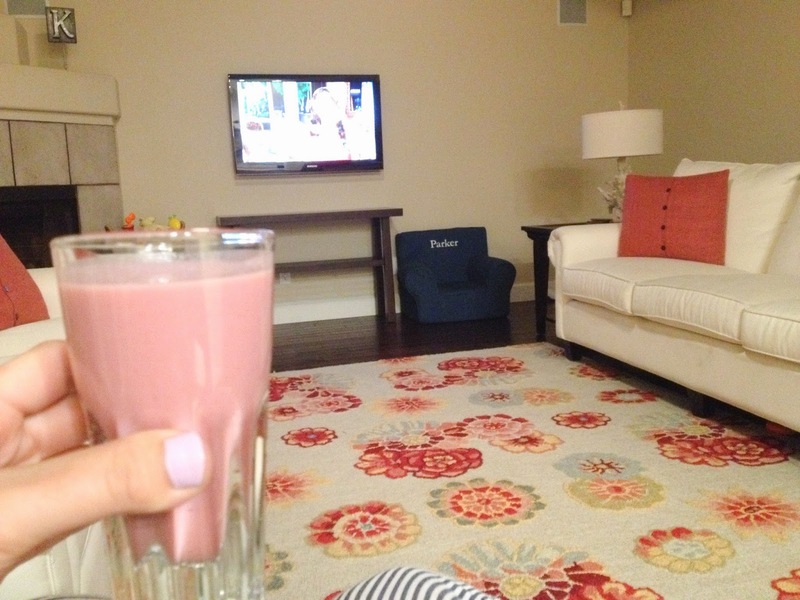 Time for Real Housewives and my (bonus) dessert drink. 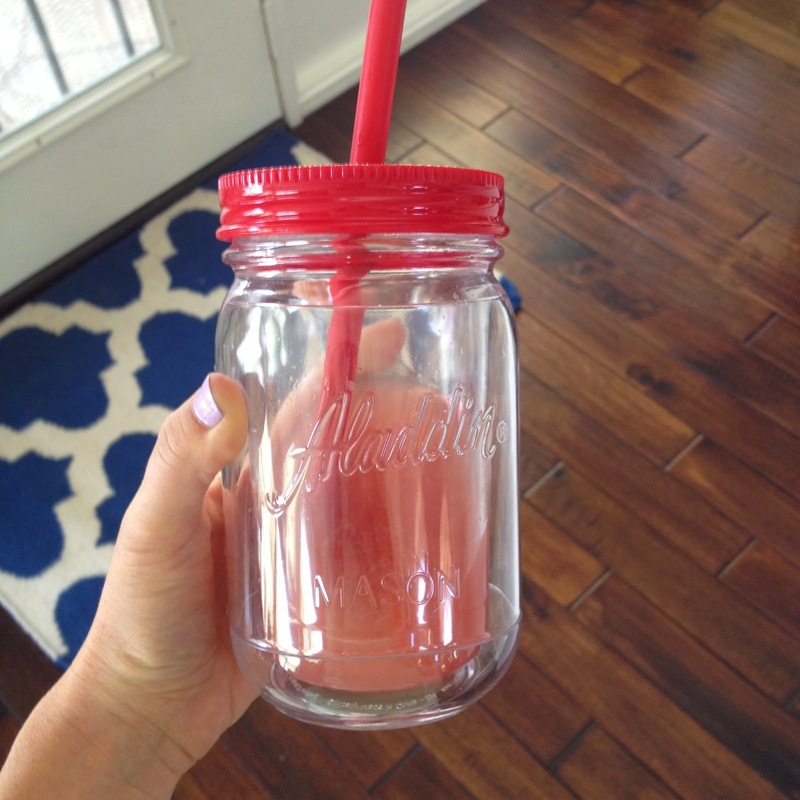 Strawberry Warrior Almond Mylk. Ahhhhh. I only drink a bit, after having juice all day almond milk feels pretty rich and decadent. 10:30PM I go to bed with just a little pang of hunger, nothing too bad, and not enough to discourage me from doing day two!